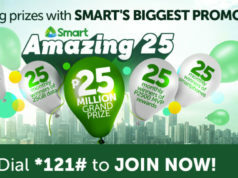 EasySurf: TM Data Promos with Free FB, YouTube, Spotify, Games and more! Being a subsidiary of Globe, Touch Mobile (TM) has a lot of TM data promos that subscribers can take advantage of. Although Globe promos can also be done by TM subscribers, a lot of TM data promos are better and more efficient. In this article, we will be discussing one of the more popular TM data promos you can get – the EasySurf promos. This is the newest TM data promos that the company offers. It’s packed with a lot of freebies, as a matter of fact, choices of free apps if you subscribe to either the EASYSURF599 or 999 are: Facebook, Viber, Snapchat, Games (Arena of Valor, Mobile Legends, Pokemon GO, Clash of Clans, & Clash Royale), Twitter, Instagram, YouTube & Daily Motion, Spotify, or musical.ly; HOOQ & Disney are available freebies for EasySURF599 & 999. NOTE: This new freebie is available until July 31, 2018 only and includes the apps listed above. How can I register to the EASYSURF promo? In registering, you just need to send the keyword and send it to 8080. Example: EASYSURF599 and send to 8080. What are the keywords for these TM data promos? How will I know if the promo is active on my account? Would I be able to check the status or the remaining MBs on my account? Definitely! You can check how much MBs you have left for you not to use raw credits or load. You can do that by texting EZSTATUS and send it to 8080 for free. After doing so, it’ll give you the remaining data that you have for your EasySurf promo. In the response you won’t know how much data you have left including the data you have left from your extra 2GB freebies. 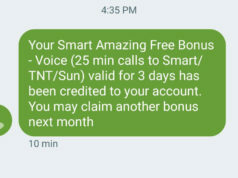 To know the remaining data you have in your freebies, Text EZ<denom> <freebie> STATUS and send it to 8080 for FREE. Ex: Type EZ50 Instagram STATUS send to 8080. Fortunately, yes. You can subscribe to other EasySurf promos while you’re subscribed to an EasySurf promo as of the moment. It’ll stack with whatever EasySurf promo you’re subscribed to. However, 30-day EasySurf promos could not be stacked like the EasySurf299, 599, and the EasySurf999. Other and smaller EasySurf promos can be stacked with one another. In addition, you can just have one freebie (you can’t have two freebies at once). So, don’t be surprised if you’ll only see or use one freebie out of your stacked TM data promo. Are you a Globe/TM subscriber? Are you looking for good data promo, specifically TM data promos? Worry no more because these EasySurf promos are the newest addition to the data promo family! You won’t just get the data that you need, you’ll also have freebies you can use with your EasySurf promo! 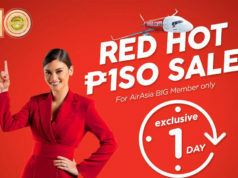 Next articleGlobe Combo Promo Tricks: New Promos for Globe Subscribers? 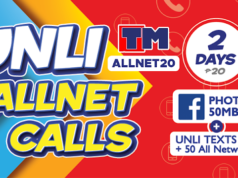 TM ALLNET20: Unlimited Calls to All Networks! 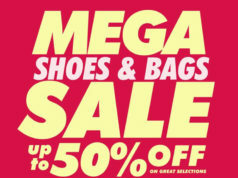 50% Off on MEGA Shoes and Bags Like Converse, Smasonite, Keds and More on this Four-Day Sale! 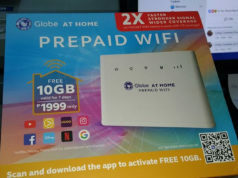 Globe Subscriber Gets P3 Million Bill Shock!